>..it’s back to work I go. I thought it would be fun to put together some of my lonely little orphan beads ( leftovers from sets) with some of my hand dyed silk ribbons. I’ve included two generous 3 foot lengths of silk in accenting shades along with one of my handmade glass beads. 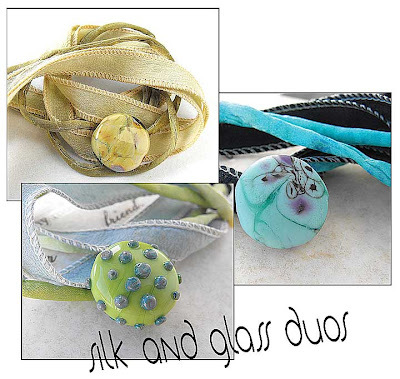 If that interests you, check out my etsy shop for these silk and glass duos. § 3 Responses to >hihohiho..
You are currently reading >hihohiho.. at fireandglass.